Chiappa Firearms' M1-22 creates the look and feel of the venerable USGI M1 Carbine but chambered in the inexpensive and easy to shoot .22lr. 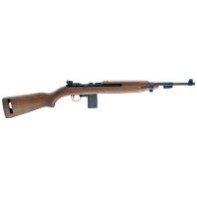 A great .22 rimfire rifle in its own right, the M1-22 has the exact overall dimensions as the original adding the fun and attractiveness of this carbine. Available in either wood or polymer, the stocks are interchangeable with genuine M1 Carbines. The trigger group and safety also are patterned after the original and look and function exactly the same. Like the original, the M1-22 has a sliding rear sight and winged front sight, as well as a dovetail machined on top of the front and rear receiver rings. Each M1-22 comes with two 10 round magazines.